Honey bees are beneficial for pollination and producing delicious, golden honey. 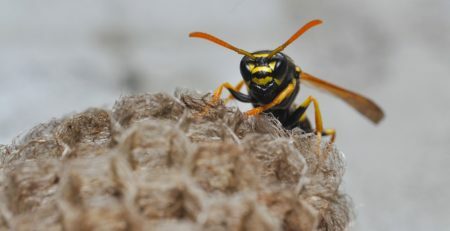 Once you see them buzzing around your home, however, it’s time to call The Bee Man for professional bee and wasp removal. 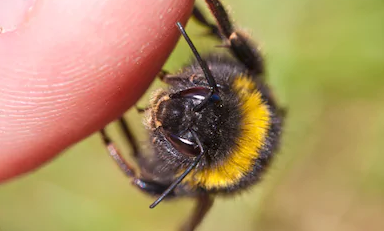 Without correct and timely intervention, it’s only a matter of time before people and pets get stung, not to mention the potential structural damage to your property. From afar, honey bees look similar to other bee types and yellow jackets. Identifying honey bees is a critical step toward removing them from your home. A honey bee is typically 12 to 15 millimeters long. It has a hairy body with yellow and black or brown colors. 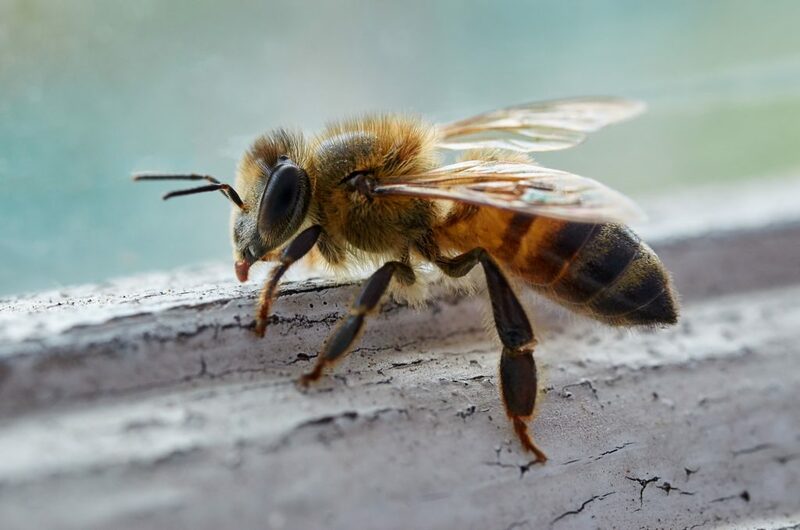 Honey bees have two pairs of wings connected to their thorax. These insects possess a barbed stinger near the end of their abdomen. Measuring around 3 millimeters in length, they remain retracted inside the bee’s body until they’re used. Scout bees prefer hollow trees as colony sites. Unfortunately, they build honeycomb in any location that has a void space that they perceive is safe. This can include fence posts, walls, old furniture, meter boxes, bird houses, wood piles, crawl spaces, attics, and more. As bee and wasp exterminators, we highly discourage homeowners to avoid engaging the bees as much as possible. 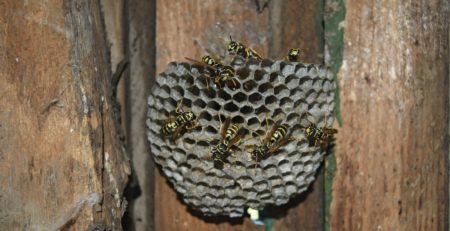 Do not swat them or spray them with water, and never try to remove the hive on your own. 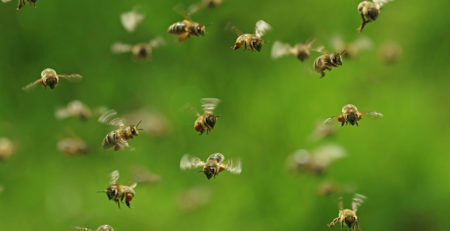 When provoked or disturbed, honey bees will not hesitate to attack. Honeybee stingers are barbed. This means that the stinger will embed itself in your flesh and continue pumping venom until it is removed. If you or a family member is severely allergic to this venom, it will only take a few stings to trigger a life-threatening condition. Apart from the health hazard, unwanted bee populations in a home can also cause property damage. 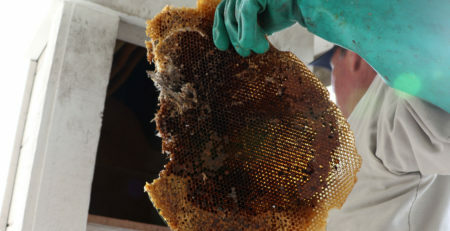 If the combs melt due to temperature changes, or if the colony dies out, the honey and wax left behind can cause big problems. This includes attracting more vermin and pests, as well as creating unsanitary conditions. Will the bees leave on their own? 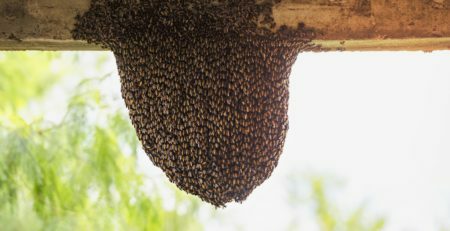 If a swarm just landed near your home, it may leave between one to three days. After that, they will need to build a hive to protect their queen and survive. Once they’ve built their hive, they will become territorial and difficult to evict. 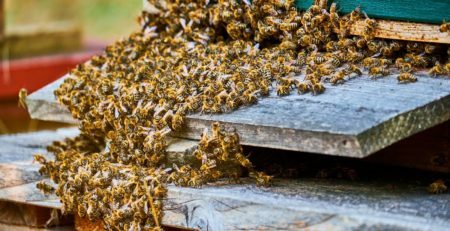 Since homeowners have no way of knowing whether the swarm is temporary or permanent, it’s best to call for professional intervention. Is it possible to remove the bees alive? At The Bee Man, we always try our best to save as many bees as possible. However, this isn’t possible for many cases. 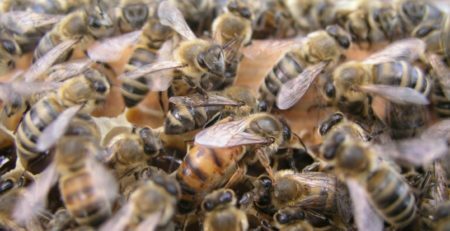 Whether we can remove the bees alive or not depends on several factors, such as public safety, access to the hive, stage of formation, and the age and condition of the hive. What can you do if bees are getting inside your house? Remember that light attracts bees, and they often enter your home through canned lighting, vents, and fireplaces or chimneys. To block their entry, you can cover the fireplace, turn on vent fans, and turn off canned lighting as you wait for bee removal specialists to arrive. 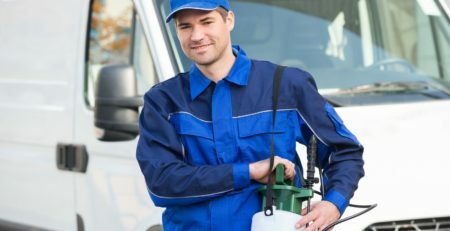 Call The Bee Man for Expert Bee Removal in Orange County! Bee removal can be very risky for the inexperienced homeowner. Handling bees properly requires proper equipment, suits, technical skills, and expertise. Let The Bee Man handle your bee and wasp problem – contact us at (949) 455-0213 today!